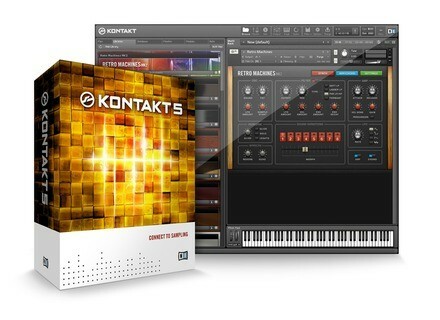 Kontakt 5, Virtual Sampler/Sample Player from Native Instruments in the Kontakt series. Kontakt 5 is the next generation of the software sampler, designed to offer enhanced sound shaping as well as advanced instrument design. Guitar Rig 5 Pro is the latest version of the effects studio. The fifth generation expands the feature set of the software with additional amplifiers and effects, speaker emulation, and various new features. Studio Drummer is a new instrument for the creation of acoustic drum tracks. By combining sampled drum kits and a mixing environment with an assortment of grooves, the Kontakt-based instrument provides a "virtual drummer" for pop, rock, metal, jazz and related music styles. The new Solid Mix Series is designed to emulate the EQ and dynamics sections of a classic mixing console, while Transient Master recreates a hardware processor designed to provide transient processing. Both products can used be used with the free Guitar Rig Player, or expand the arsenal of the Guitar Rig 5 software. All new Komplete Instruments and Effects are available now for individual purchase, and are also included in the new Komplete 8 and Komplete 8 Ultimate bundles (Solid Mix Series only included in Komplete 8 Ultimate). V-Plugs Mr. Soundman V-Plugs has introduced Mr. Soundman, a free ear training game for music producers and sound engineers.